We partner with IT Desk in Kent to deliver Flobot to companies of 20 users and less. Why do we do that? Quite simply because they have more expertise in this market with access to better resources and provide better support and implementation than we can directly at Fresh Milk Software. Generally at below 20 users a company may not have a dedicated IT department or even a dedicated IT person. IT Desk are experts at mapping your current processes to the software, streamlining them where needed, removing some where they are not productive at all. And they can help with all the other things you have never got around to. Setting up proper domain level email addresses, looking at your security, advising on pc, laptop and tablet purchases and integrating Flobot with your existing systems. A very useful partner. Build quotes and estimates super fast and get them to your clients instantly. Makes you look great. Send your invoice now - right away. And install the payment gateway to get paid in real-time, right now. Schedule visits for estimates or jobs, send text messages to your customers to confirm. Get organized. Keep details of all customer interactions, phone numbers and email addresses. Start building a client base. What is different about Flobot? 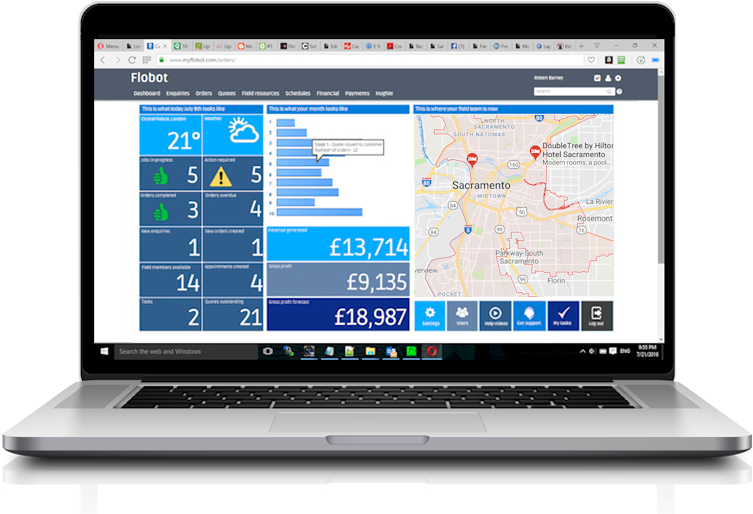 Flobot is a feature reach, configurable platform and can be used 'out of the box' - just like the hundred other Field Service Job Management SaaS companies you have looked at. What sets us apart is our ability to customize Flobot to our client's exact requirements with bespoke coding, allowing them to have their own 'instance' of the software - a fully tailored software package created to effectively just for you. No-one else offers that service at a price that anyone outside a blue-chip can afford. Talk to your partner about it. Either way there is Flobot for the small companies and Flobot for the bigger. Mostly they share a lot of features but as the complexity in your company increases so does the need for more sophistication, resources and training in your job management software. We think this arises at about 30 users and below that threshold we have Flobot Atom and above it we have Flobot Enterprise. From quoting and scheduling to invoicing, Flobot Atom will run your service business operations beautifully. Optional SMS and postcode look-ups. With Flobot Atom the more users you have the cheaper per user it gets. A user is anyone who interacts with the system in the office or the field. Build a quote in the app. Flobot never stands still. It is updated, developed and improved every day using the feedback we get from our customers. Welcome to Flobot Enterprise. A whole host of advanced features and settings are waiting to take your company to the next level. White label and bespoke coding. Flobot is software like no other. Flexible and customizable it can be coded to make it work the way you want it to for your business. Have your own bespoke version on your servers. * To use Flobot's Payment Gateway you will need a SagePay subscription which starts at 24.99 per month per business - contact us for more information. * A user is defined as anyone who has password access to the field app or system. * Survey based on 12 Flobot Atom and Enterprise Customers 2017.